Missie Bee – Year 6 teacher with an abnormal love of grammar, reading and singing. Year 6 teacher with an abnormal love of grammar, reading and singing. All percentages are rounded, and therefore may sometimes add to 99 or 101. Hope you find them useful! I also created this (full document available to download on TES here) for last year’s arithmetic test. I created these for the previous years’ grammar papers, and if I find the time, may do so again this year. Spelling. My teaching nemesis. I’ll admit, I’m not a fan of teaching it – probably because I haven’t found anything that works. So many people replied (thank you everyone! ), so I have collated them here in case they are useful to anyone else. If anyone has any more, particularly for those pesky words on the Year 5/6 (or Year 3/4) word list, then please tweet me so I can add them on! As you may know, I’m really interested in the teaching of reading and how to improve it. 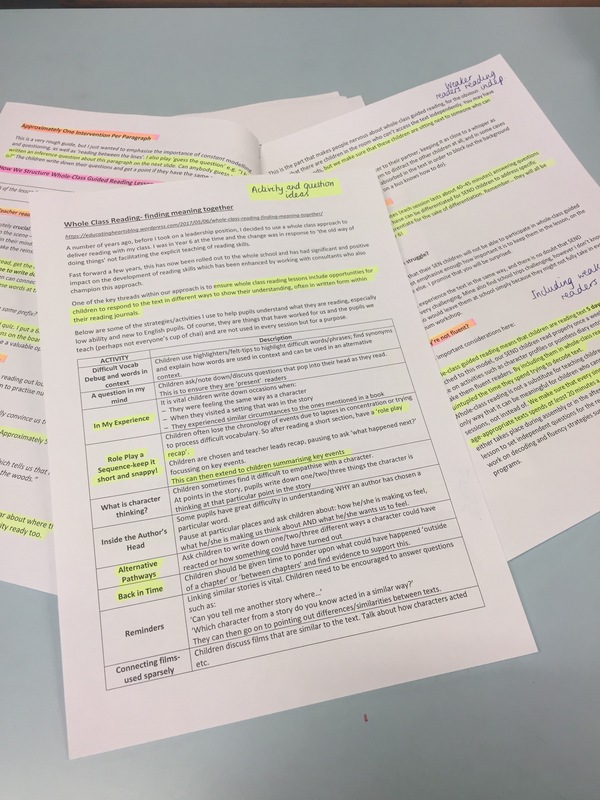 Our school teach reading through a carousel method, but I’ve managed to trial a few different ways over the few years I’ve been teaching. I still haven’t found anything that I’ve thought has really worked (although some ways are clearly better than others), so I’ve taken it upon myself to do some research (that word makes me all hot and sweaty just typing it. I haven’t done any proper research since my uni days!). I’m starting off with a few blog posts, and these are the best ones I’ve found so far, so I thought I’d share. Hope you find them useful too! Mentoring: a problem or a privilege? 1) University tutors: how sure are you that your trainee teachers are getting good quality mentoring in their schools? 2) Head-teachers: how sure are you that your staff are providing good quality mentoring to students you have placed them with? 3) Trainees: how sure are you that you are receiving good quality mentoring in your placements? Is there anything you can to be about it if you aren’t? Are there any good answers to these questions? It’s difficult. When I think about who has made me become the teacher I am today (and I am still developing, as we all are, but I am completely different to the teacher I was 3 years ago), a few key people come to mind: my 3rd year mentor (my course was 4 years), my NQT mentor (now my team leader and partner teacher! ), my deputy-head and head-teacher, and my mum (also a year 6 teacher and deputy-head). All of these people are, or have recently been, practising classroom teachers. So I guess an assumption we can all safely make is that the best person to teach a teacher is an actual teacher. When I was an NQT, I blogged about all the issues I had with university-based ITT. Yes, the theory of education is important, but there’s only so many times you can sit and listen to somebody read off a PowerPoint about Vygotsky’s ZPD, or all the different ways you could effectively teach a child with ASD, or something else that, really, has no meaning to you until it’s put into practice. So, as I’m sure most teachers would agree, the lessons you learn on your teaching practices are invaluable. (Last bit about me, I promise). When I was training, my university was so desperate for school placements that some students didn’t find out which schools they were going to until the day they were supposed to start. Some students even had to delay their placement by a week, because a school had either pulled out at the last minute, or they just still hadn’t been found a placement school. “It’s really hard to find a school that will take a student!” we were told. It was only when I was moaning to my mum about how we were all struggling to find anywhere that she admitted she’d never taken a student either (after convincing, she took one on later that year!). I understand there are so many reasons for this: students take up a lot of time; if they are weak, then it is hard work; the progress of your class is in someone else’s hands, etc. However, what message does it send if schools are turning down the opportunity to train our future teachers? “We don’t have time for you, but somewhere else will?” Perhaps it’s different now – perhaps schools are desperate for students as recruitment is now so hard, at least they can train up their own staff! The response I had from Twitter was huge – many people (lots of whom are experienced teachers now) responded with anecdotes of particularly questionable behaviour from mentors that have clearly stuck with them to this day. I’d like to share some below. For what purpose? Well, mainly in hope that anyone who does read this and would like to mentor in future follows this as a guide what NOT to do. I was told I was too emotional to be a teacher. My first mentor sent lesson plans back with massive corrections and expected them to be done that same night. I was treated like an extra pair of hands – break duty every day, expected to run clubs on my own and not given any behaviour management support. I couldn’t wait to finish. On my placement, I was abandoned whilst the class teacher was given time to plan her wedding. I never saw my mentor! I was left to it – no feedback or advice given at all. My mentor told me she never wanted a student in the first place – she only accepted one so she could move up the pay scale. I was told I wasn’t doing enough behaviour management for school’s expectations. I dialled it up and was then criticised for being like a ‘sergeant major’. I got told everything I did was wrong and when I asked how to improve they didn’t say anything. My first placement mentor abandoned me with their class, despite telling me that they were ‘a handful’. I nearly quit! One of my mentors was abjectly rude, unsupportive, interrupted my teaching, criticised rather than supported. My last placement mentor talked loudly in the staffroom about me not uploading some planning in the right folder, then did a gunshot action to her head in full view of me and the other staff in the corridor. I went home and sobbed – I’ve never felt so small before or since! My mentor wanted a clone of her style when I had lots of ideas and was open to try new things! Mine just tried to make me into a mini version of herself. I had a placement 200 miles away from where I teach. Got put into a year 2 class on day one and nobody spoke to me again for weeks. I’d go as far as to say the staff actively avoided me. Didn’t get any feedback or anything for literally 5 weeks. My lessons, that I had spend hours planning, weren’t reviewed, I was ignored, she wouldn’t let me teach due to her own control issues – just generally unpleasant. I could detail everything we could learn from what was said above, but we’re all clever people. I think it’s pretty obvious what makes a bad mentor, and what makes a good one. One common theme (amongst many comments and messages that weren’t shared here) seemed to be mentors trying to make students a replica of themselves. It’s hard to separate judging methods of teaching, and judging the effectiveness of said teaching. Your student might do it differently to you but… is it working? And if it’s not, it doesn’t mean because your way is the only right way. Another common thread was the negative representation of the teaching profession – if your mentor, someone who is more experienced and superior, is constantly belittling the career that the trainee clearly wants to love, or could be learning to love, no wonder teachers are dropping like flies. Let’s look at the positives. Here are some stories of mentors that have had a lasting impact on these teachers’ lives – and for good reason. Potential mentors: see this as a guide of what you SHOULD do! My final mentor was excellent. She was welcoming, approachable, positive yet constructive, and generally made me feel like part of the team. She really appreciated my contributions to school life. My 3rd year mentor completely trusted me and let me try my own things out in class. She gave me realistic feedback and was always there when needed. My NQT mentor was incredible. Had the highest standards ever but supported me to get there. He was, and still is, my biggest champion. Both mentors allowed me to take risks and trusted me to be ‘the teacher’ without completely dropping me in the deep end. My best mentor was very clear with me, very positive, and has been a kind friend, asking about my family and interests. I had two excellent, experienced mentors who knew how to encourage and challenge me at the right times. They listened to me and treated me with respect. Mine let me try things out even when she knew they were crazy – and didn’t judge if it went pear-shaped. A brilliant mentor lets you know they trust you. Means so much. My mentor was very experienced, cared deeply about the kids and staff, challenged and supported and challenged some more, was human!, and always had time for people above everything else – have carried that one with me, very consciously. My 3rd year mentor was SO amazing. Calm, patient, understanding and approachable. Nothing was too much trouble, even if I knew it was! Nothing was too much for my NQT mentor. Door was always open, she was interested in me as a practitioner and an amazing teacher herself. I had two brilliant mentors. They appeared to really trust me. Let me try things and if they went wrong, picked me back up and pushed me to go again. My 3rd placement mentor helped me to understand work-life balance and to not always try and ‘reinvent the wheel’! My wonderful mentor taught me that it is impossible to deliver outstanding lessons all day – a bit of realism goes a long way. Simple – told me exactly what I was doing well and how I could improve! I had an amazing mentor who really helped build my confidence by encouraging me to focus on the good rather than dwelling on what went wrong. She was always willing to listen too and never dismissed how I was feeling but reminded me that everyone has bad lessons/days! Mine was full of praise and energy, willing to let me try anything and also called me a teacher from the get-go. My mentor helped me regain my confidence after I nearly quit teaching – she was honest and constructive and said just what I needed to hear without lying! My mentor let me take risks, encouraged me to have a real ‘can do’ attitude and learn through trial and error. She also had a wonderful work-life balance and recognised the importance of doing fun/relaxing things for yourself! Anecdotally, we know schools are struggling with recruitment. At the end of my 4-year BAEd, just under 50% of the course had dropped out. (I did a quick Google to see if this pattern was still consistent now, but I couldn’t find any data newer than 2015 – it’s 1am, let me off.) Knowing how big a part teaching practices play in a trainee’s career (after all, we’ve all seen many trainees boast of being an ‘outstanding’ student – it’s the mentors that award these grades! ), isn’t it imperative that their experiences are high-quality? I know there are exceptions (some students are lazy, yes; some students clearly don’t want to be there, yes), but if your student ‘fails’ their teaching practice – isn’t that your fault? Unless you’ve done everything you can to help them, wouldn’t you feel some sort of guilt knowing that you had failed them? Or is this too much pressure to be putting on classroom teachers who a) already have the pressures of their daily job, and b) don’t get any extra time or money to mentor a student? I’m not sure what the answer is. What I do know is that if you’re chosen to mentor a student, you are about to make some sort of lasting impact on their career: it’s your choice whether it’s positive or not. Author missiebee1Posted on June 3, 2017 June 3, 2017 2 Comments on Mentoring: a problem or a privilege? Taken from my old blog, http://www.newandquietlyterrified.co.uk. Something that really helped my bottom-set year 5s with their arithmetic and retention. A quirky, but memorable, acronym that has helped children to remember the eight different word classes. Written whilst on a terribly boring course. Supportive schools – they do exist! Bigging up my amazing school for how they supported me through my NQT year (and continued to support me fully thereafter). In which I ponder the point of displays in the primary classroom. I’m constantly looking at new ways to teach reading as I haven’t found one I think is effective yet. One perspective on why carousel isn’t the best way. Please be aware that this is what I did at the time. I’ve got the job – now what? What to do in the summer before your NQT year begins! Missie Bee Create a free website or blog at WordPress.com.